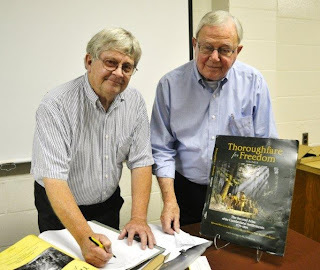 Co-Author Jack Masters signs his newest book Thoroughfare for Freedom for Society President Joe Davenport at the most recent meeting of Cannon County Historical Society. A Program dealing with North Carolina Land Grants was presented to an enthusiastic Society Membership in conjuction with the regular meeting of the Cannon County Historical Society last Monday May 10th. The new books were received the day of the meeting and will be mailed to those who previously ordered starting in the next few days.